Coreopsis Walberton’s® Flying Saucers is a long-flowering, compact herbaceous perennial that’s been delighting gardeners since its launch in 1997. Wildlife adore the glorious golden-yellow flowers, which put on their show from June all the way through to October. ‘Flying Saucers’ was bred at Walberton Nursery by world leading plant breeder David Tristram. Many years were dedicated to trials of the new Coreopsis to ensure British gardeners get the best possible garden performance. What does it take to produce this British beauty? In total it takes more than 500 man hours to produce a year’s crop of 2L Coreopsis Walberton’s® Flying Saucers. We use our own micro-propagation laboratory at Walberton Nursery in the production cycle, to ensure the crop is vigorous and uniform. 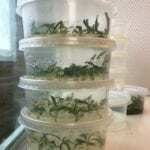 In addition, the micro-propagation process means the plants remain sterile. This is vital to maintain the impressive flowering period, and importantly, be virus free. 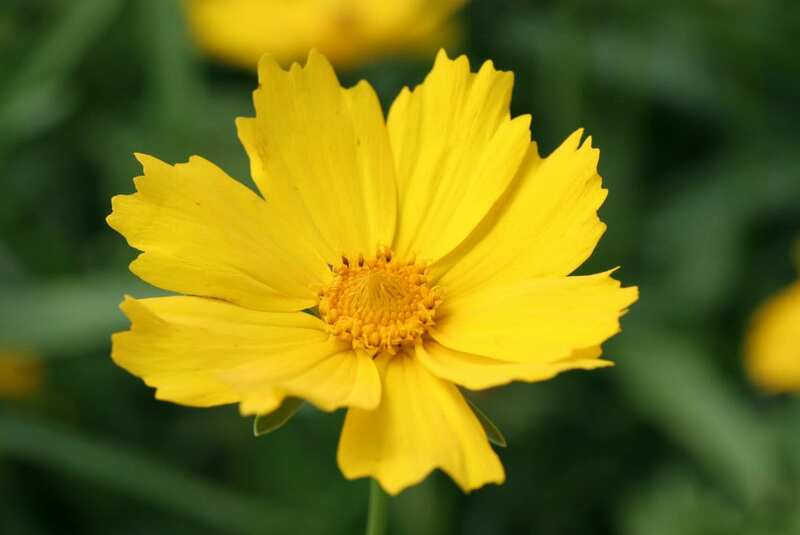 David Tristram, founder of Walberton Nursery, bred Coreopsis Walberton’s® Flying Saucers. Although a chemist by training and a brewer at Guinness in Ireland for 20 years, David started the nursery in Sussex in 1973. David had grown up in a family tradition of gardening and amateur botany. His father found and introduced Helleborus niger ‘Potters Wheel’. So it’s not surprising that David also wanted to breed and introduce new plants. There are two major breeding programmes within the Farplants co-operative. The other focuses on Nemesias and has produced garden favourites Nemesia Wisley Vanilla and Nemesia Fleurie Blue to name but a few. We also work closely with other plant breeders to bring exciting new ranges to UK garden retailers. For instance, new for 2018, we launched Digitalis Firebird. 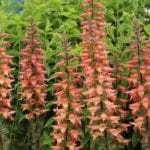 This stunning hardy perennial produces 90cm spikes of striking pink and apricot flowers. It won the HTA National Plant Show Visitor Award for Best in Category – Herbaceous Perennial. The micro-propagation laboratory at Walberton Nursery develops and supports our breeding programmes. It produces elite propagation stock and initial multiplication of new plants. 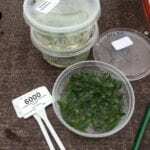 Much of our work is to test for virus and to clean up stock where needed by meristem culture techniques. ‘Flying Saucers’ is one of only a handful of plant varieties from our breeding programme that is completely propagated in-house. Our skilled Lab Technicians divide the mother stock and add it to growing medium. The cuttings are grown in a sterile environment to establish roots. We produce over 1000 elite mother stock plants to ensure we have ample uniform plants to take cuttings for the following year’s production. Each individual cutting from the micro-propagation lab is carefully planted by hand. 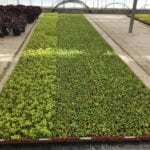 They are then grown in the warm and humid conditions of the propagation house. The propagation team closely monitored them until they are ready to be moved to be overwintered and grow on. Once the mother stock is ready, we take many thousands of cuttings and plant by hand. These are grown in the propagation house to establish the roots. They are trimmed and moved to another glass house to harden before they move outside. 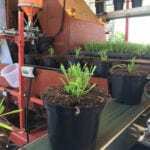 Once ready for the Sussex sun, we use the potting machine to pot on the ‘Flying Saucers’ at a rate of more than 1500 per hour. The high light levels on the Sussex coast provide optimum growing conditions. As a result, in June they are ready to be lifted for their onward journey to UK garden centres. Once we receive orders, the plants are carefully handpicked from the outdoor bed, where they are cleaned and have a colour care card applied. They then make their way to our purpose built 8,000m2 Finishing Centre where they are barcoded and loaded. Our specialist delivery partner collects them for their onward journey to centres throughout the UK. On our busiest day, we processed and despatched a whopping 1800 trolleys through our Finishing Centre. There is a balance between the human touch and the efficiencies of machines. Human expertise and care is unmatched in certain tasks. Breeding is very much a skill and a hands on process. 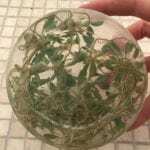 Also, carefully taking cuttings within the lab or from the mother stock needs the skill of a trained person. 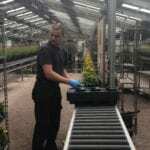 This care ensures fantastic success rates for new plants establishing, whether this be in a sterile environment or within the propagation unit. However, some steps do benefit from the efficiencies of a machine. For instance, trying to uniformly trim thousands of young plants by hand is a painstaking task to say the least. Investment in trimming equipment, has turned this from a week long slog into a 5 minute walk in the park. This frees the staff to focus on tasks such as ensuring the optimum propagation conditions or managing our eco-friendly biological pest control. We carefully review our processes to ensure we get the balance just right to ensure we keep producing the best quality plants. Coreopsis Walberton’s® Flying Saucers is a wonderful garden performer and is a truly British crop. Bred, propagated and grown here in Sussex, it travels less than 1 mile during production. Exclusive to Farplants, it’s sent all over Britain for UK gardeners to add its wonderful vibrant hue to their gardens for years of enjoyment.